I want to tell you about this Just Cook Herbed Coffee Rub. I love rubs and this one is so unique and delicious with coffee in it! This works on beef, lamb and pork. For the very best results, I found that lightly oiling your meat with canola oil, then massaging in the rub and letting it marinate for 1 – 2 days lets your meat really absorb the exotic combination of flavors of this wonderful west coast blend. 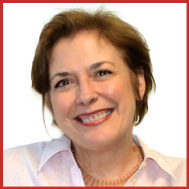 The company is based out of San Francisco and headed by a husband and wife team. 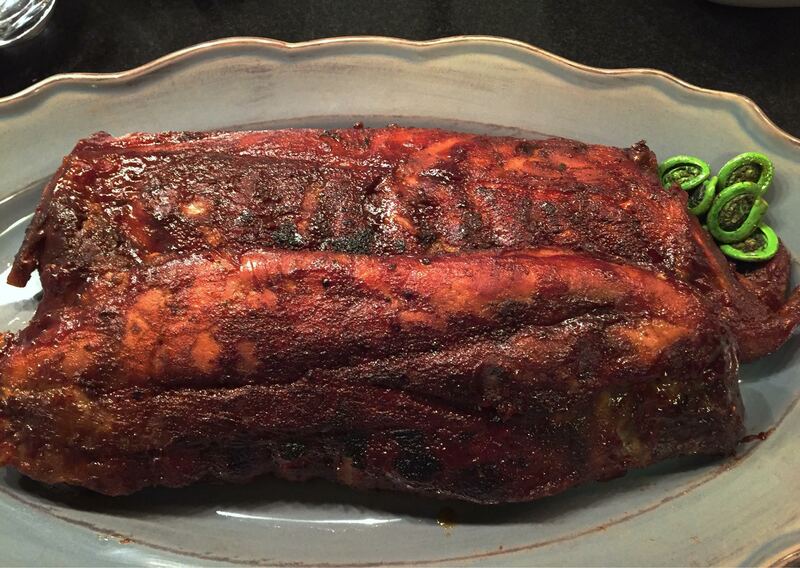 I used the rub on these boneless country pork spare ribs and it was outstanding!! You can have fun and experiment with lots of different cuts of meat but don’t skip the marinating overnight, and 2 days is even better. I love rubs because they are a quick and easy way to make a protein special. Here, Just Cook Foods has done all the hard work concocting their blend to make you look like a superstar chef. I love the heady coffee smell in this one – really gets me going! And, it’s combined with oregano, cumin and chipotle to really whet your taste buds. Many rubs go too heavy on the salt. This one does not. In fact, I found it a bit light on salt which is why I added a sprinkling of crushed Maldon salt to finish. You taste and decide, of course. Now on to the recipe. While this cut of meat is called “ribs”, it’s a misnomer as it’s really part of a traditional pork chop so it does not need to be cooked long, which makes this recipe perfect for a weeknight dinner and fancy enough for a dinner party. Apples and cranberries go so well with pork and look festive for the season. Just Cook with LOVE and their rub and have a happy Sunday while you get ready for New Year’s! Wash and pat dry your meat with paper toweling. Rub in the canola oil, 1 tsp. for each side of the meat. Then rub in the Herbed Coffee Rub, approximately 1 Tbs. for each side of the meat. Place in a glass pan, cover with plastic wrap and refrigerate for 2 days. On the day you’re cooking, ideally, allow the meat to be at room temperature for 1 hour. In a large skillet, warm the olive oil. Raise heat to medium-high and add the butter. When the bubbling butter subsides, add the meat and cook for 5 minutes, lowering heat slightly. Flip the meat over, add the apples and cranberries and cook for 4 more minutes. 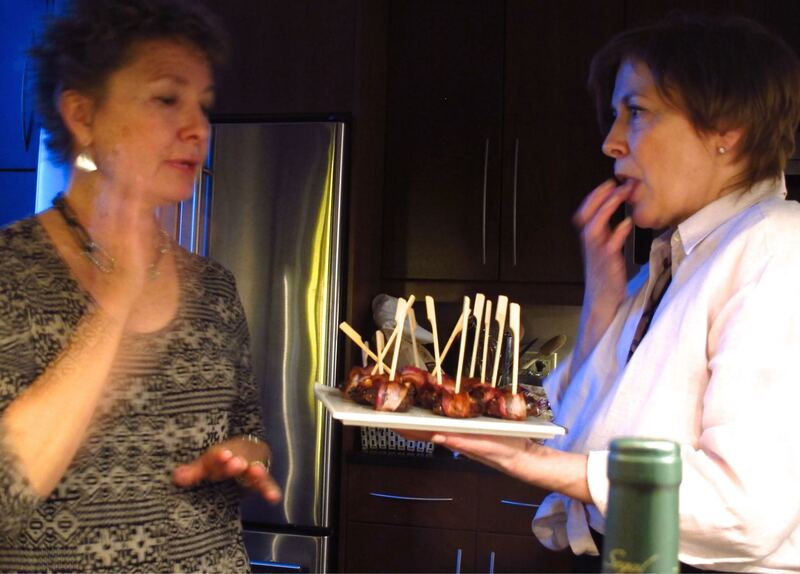 Then add the white wine and cook for 2 more minutes or until an instant read thermometer registers 135 – 140 degrees. Remove the meat to a warmed platter and let rest for 5 minutes. 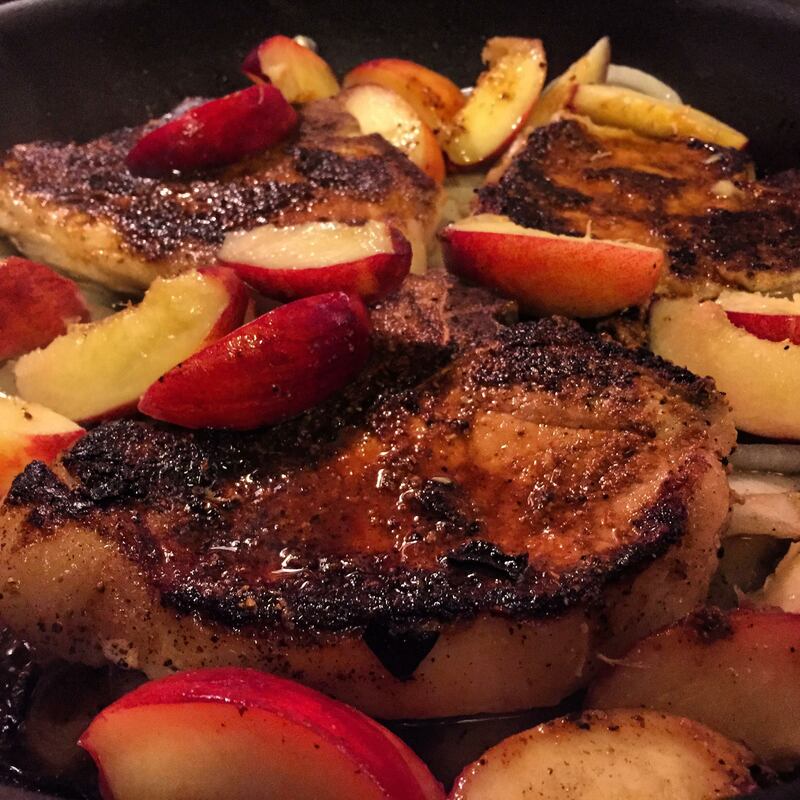 Leave the apples and cranberries in the skillet while the meat is resting. They may need a little more cooking so do that carefully as you don’t want your apples to be too mushy, just tender and golden brown. Pour apples, cranberries and sauce on top of the meat. Sprinkle crushed Maldon salt over all. Cut into serving pieces and serve with LOVE. Discover more exciting products like this rub to inspire your cooking in our next MARY’s secret ingredients box! The spring box mails on March 25th and they are selling fast. There’s only a limited number of them, so order now and be the cook everyone LOVES!! I discovered Sarah’s Sea Salt – Tuscan Salt a few months ago and it literally can be used on anything and everything from a myriad of vegetables, to beef, chicken, or fish – you name it! Truth be told, I am not usually a fan of flavored salts. Yes, that’s true! Typically you get some old herbs and big hunks of salt and the thing that sounds like a good idea never quite functions properly. You either get too many dried herbs and not enough salt or vice versa. Not so with this! Sarah’s Sea Salt – Tuscan Salt is a medium grain Mediterranean sea salt blended with a classic mix of dried Italian herbs, tomato flecks, lemon peel, and rosemary oil. Stir this baby up first and then take out a teaspoonful and sprinkle away – on anything – and it will taste better. Promise. Nigel Dyche and his wife, Sarah Chase of Coastal Goods, own and operate this small, family-run company. They travel the world to capture the flavors of the country. And they find the freshest, most aromatic herbs to blend with fine sea salt to make their utterly delicious combinations. 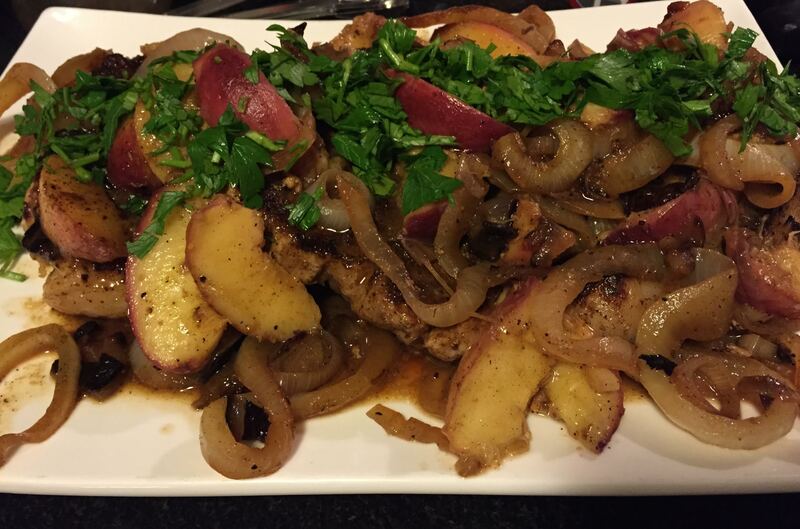 Try this pork tenderloin using Coastal Goods Sarah’s Sea Salt – Tuscan Salt. It’s a perfect fall dish, truly delicious, quick and easy, and you can use any fruits, dried or fresh, you have on hand, as well as any nuts. Just be sure to stir your salt first, so you get a good mixture of all the wonderful herbs and spices along with the fine grain Mediterranean sea salt. Heat grapeseed oil in an ovenproof skillet on high heat until almost smoking. Season both sides of the pork tenderloin with Sarah’s Sea Salt – Tuscan Salt and pat down the herbs on the meat. Brown the pork in the skillet on all sides, for a total of about 5 minutes. Pour in the vermouth and scatter the figs, apricots and nuts on the meat and in the skillet. Put the skillet in the oven to roast for 15 – 20 minutes, depending on your poundage and how long it’s been out of the refrigerator. Let the pork reach a temperature of 135 degrees with an instant read thermometer. It will gain more heat as it rests and you don’t want to overcook it or it will be dry. It is fine to be pink inside. My pork tenderloin was perfect at 17 minutes. Remove the pork from the skillet and let it rest for 5 minutes. Keep the fruit and nuts warm in the skillet on your stovetop. Add the butter to melt in the pan drippings to make a nice little sauce. Pour fruit, nuts and sauce over your meat. Garnish with parsley and serve with LOVE. Again, because all the herbs and spices are included in the salt, this helps you make super simple and easy recipes that taste like so much more work. Here I used Sarah’s Sea Salt – Tuscan Salt on oven-roasted broccoli. Toss the broccoli with the olive oil on a rimmed baking sheet. Sprinkle on Sarah’s Sea Salt – Tuscan Salt and grind your pepper overall. Toss again to distribute all the wonderful herbs evenly. Roast the broccoli for 25 – 30 minutes until tender and browned in spots. Toss the broccoli on the pan at about the 20 minute mark. This Sarah’s Sea Salt – Tuscan Salt is also great on oven-roasted zucchini halves or on sautéed yellow squash with onions and red peppers or on a rib steak with garlic powder and pepper, or in turkey burgers. I could go on and on. You will LOVE this product. Versatile, makes your cooking easy peasy and it’s delicious!! Sarah’s Sea Salt – Tuscan Salt was one of the products in our MARY’s secret ingredients fall box. You can get your winter box here! Best Barbecued Ribs Ever! Make them for the 4th of July! Nothing says summer more than barbecued ribs and corn on the cob, right? 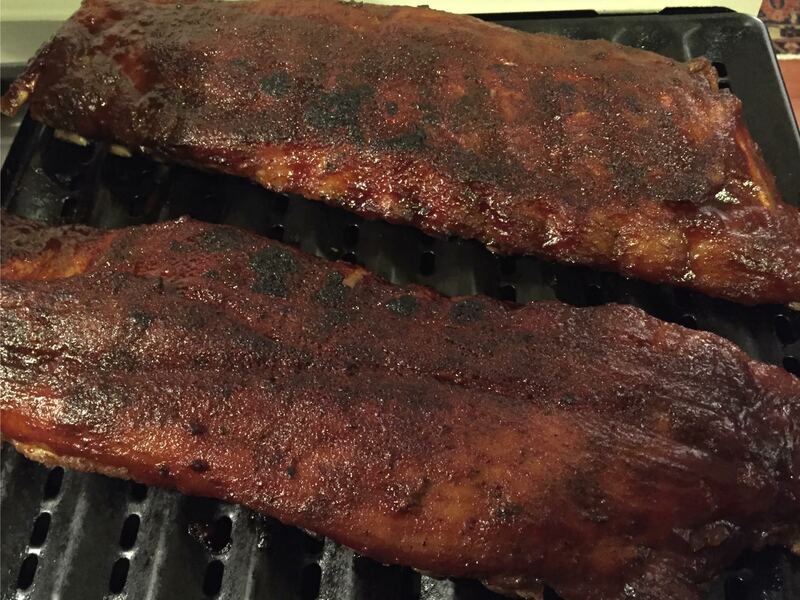 Well after years of trying, I think I’ve finally perfected my ribs recipe. And while I call them barbecue, I cheat. I have found this oven method to be so much easier, (You can set it and forget it! ), and it doesn’t use a ton of propane or time spent fiddling with the temperature on your grill. With the low, constant heat in the oven and the pan of water underneath, to provide steam and moisture, and then a final finishing on the grill (or under your broiler) to caramelize your sauce, this, for me, is the best foolproof way to cook ribs. I wanted you to have this recipe before the upcoming 4th of July weekend, so that maybe you’ll be inspired to make these Best Barbecued Ribs for your friends and family! Every time I serve these to guests, they always ask for the recipe. My original source is this crazy guy named Max Good, I think, but he goes by the name Meathead Goldwyn at amazingribs.com. Do take a look at his site if you have time, as he has interesting tidbits to share about cooking ribs and barbecuing in detail. It is chock full of information. The Huffington Post also put together an article on cooking his ribs on the grill. You can check that out here. This is his rub recipe, cut in half. At first I cringed at his inclusion of sugars in the rub but if you read his chemistry defense on the fact that the sugar creates the crust (called “bark” by the pros) and you’re really not getting very much of it, it all makes sense. 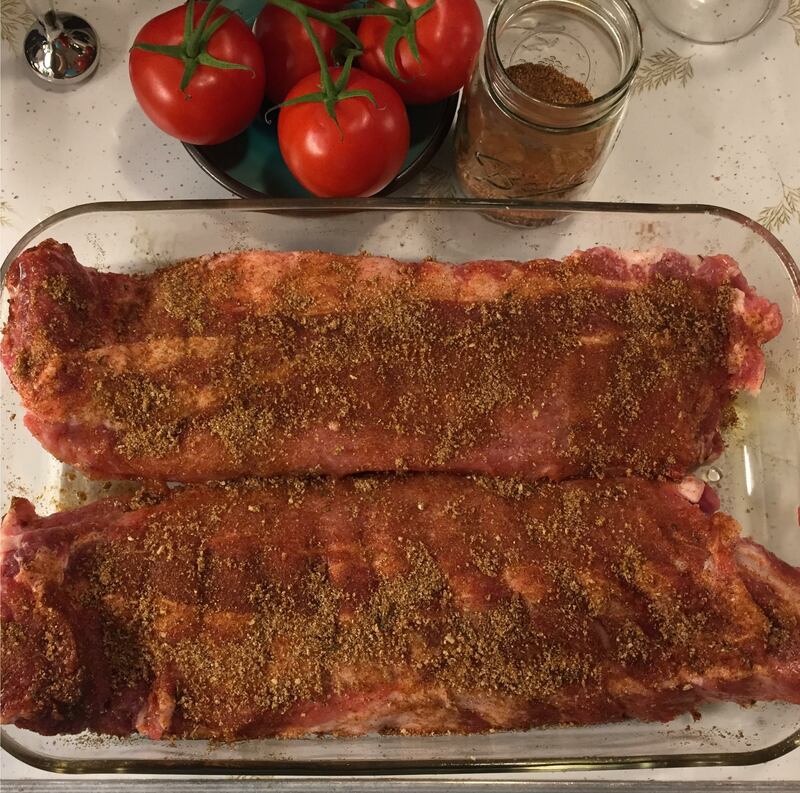 I also salt my ribs before rubbing the oil and sprinkling the rub on. If you forget to do the rub 24 hours in advance, it’s okay but not ideal. The marinating time is advantageous. Rub the oil in on all sides using about 1.5 Tbs. per side. Then sprinkle on the rub, using 2 Tbs. per side. You don’t want a heavy thick coating. You want some meat to show through as in the above photo. When ribs are done in the oven, light your grill and brush the ribs with your favorite sauce and grill to caramelize the sauce, being careful not to burn the ribs and ruin your hours of cooking time. If you don’t have a grill or access to one, you can also carefully broil them as I did here. Place the pan in the center of the oven, about 10 inches away from the flame and turn the broiler to low.Watch carefully so they don’t char. About 5 minutes per side did it for me. 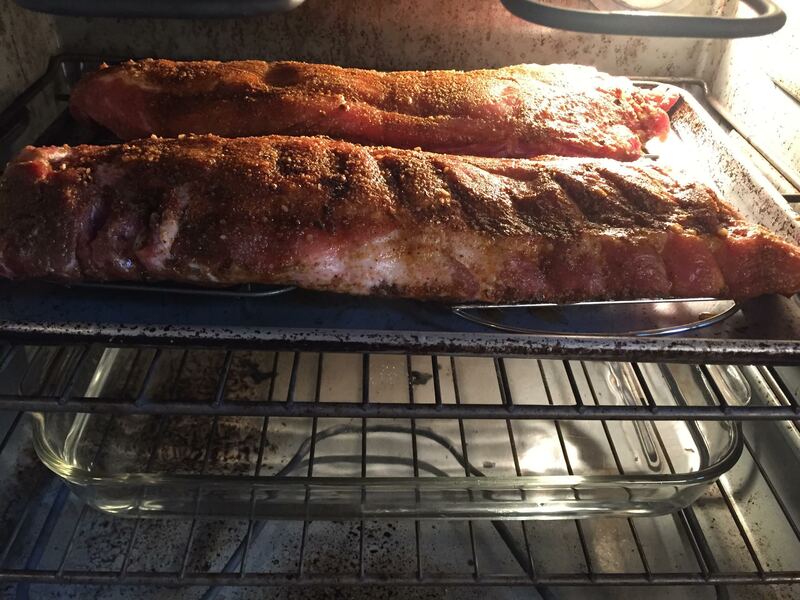 Assuming your meat is all good and natural, these will be the best ribs ever!!! I don’t know about you, but some things I cannot understand. (now I sound like my mother – hmmm, not necessarily a totally bad thing) Like, why aren’t people at home at dinnertime and sitting down and eating a proper meal? I see kids on the bus eating 6 mini powdered sugar covered doughnuts at dinnertime. Kids running on the street with 2 packs of Milk Duds grasped in their hands. I, for one, happen to hate cocktail parties or small plates the whole night long. At some point, I want to sit down, eat some real food, a real dinner, on a plate. My five brothers and me, we’re all the same. It drives some of my sister-in-laws crazy. I have friends who LOVE cocktail parties/small plates as the whole dinner. I was taught to not spoil your appetite and have a real dinner, so I hardly eat anything at those events, and then if there’s nothing more, I’m in trouble! Once, when we were kids, we took a family vacation down south. One of my Dad’s close business friends had a daughter getting married. Now at that time in the South, (maybe it’s still true today) they believed that a fancy wedding consisted of an endless champagne fountain (probably of very good champagne), cucumber sandwiches and cake! Well, here we were, 6 kids, and starving for dinner. I remember that EVERYONE got really drunk, except my mother, who didn’t think it was very funny. She was so angry and in her opinion, I remember her saying to my Dad, “John, these children are starving for dinner. Can’t these rich people feed anyone?” and begging him to leave to go anywhere to get some food for all of us. I must have been about 5 or 6 years old but it made such an impression on me. And here I am, quite the same today. 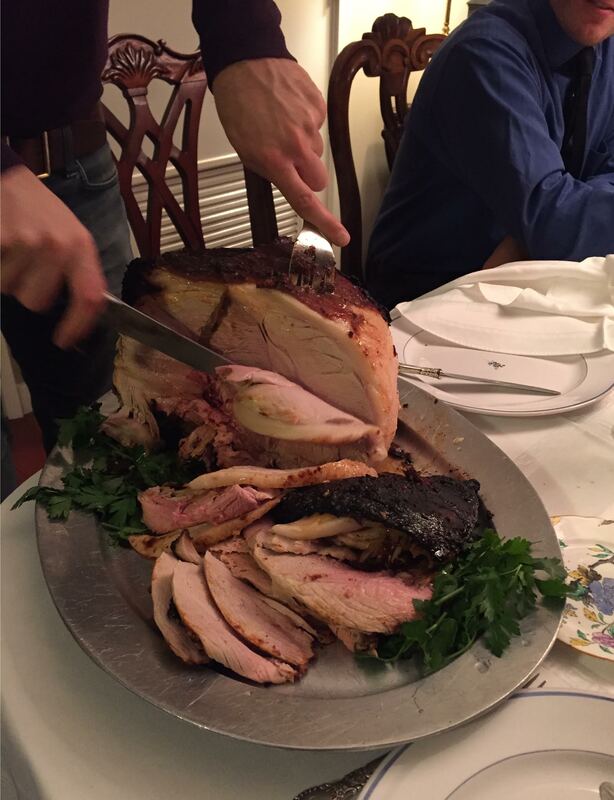 Tomorrow, we will go to a cocktail party benefit at The Apollo Theater, starting at 6:30 and I will want to leave soon after to come home to eat a dinner that I will make – Buttermilk Roast Chicken that has been marinating since Saturday. Easy, if you plan it! 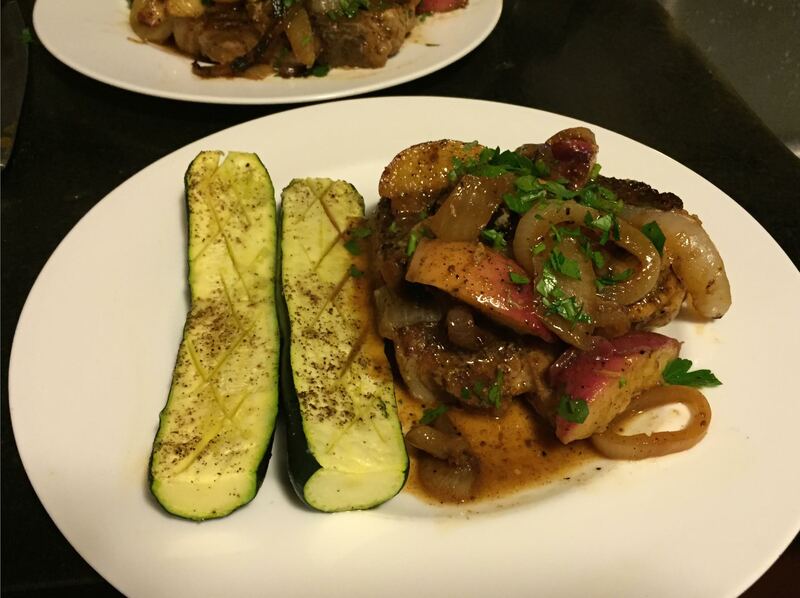 Last night I threw together this combo – pork chops with peaches, sweet onions, and shallots with some roasted zucchini. It was delicious. And we were sitting down. 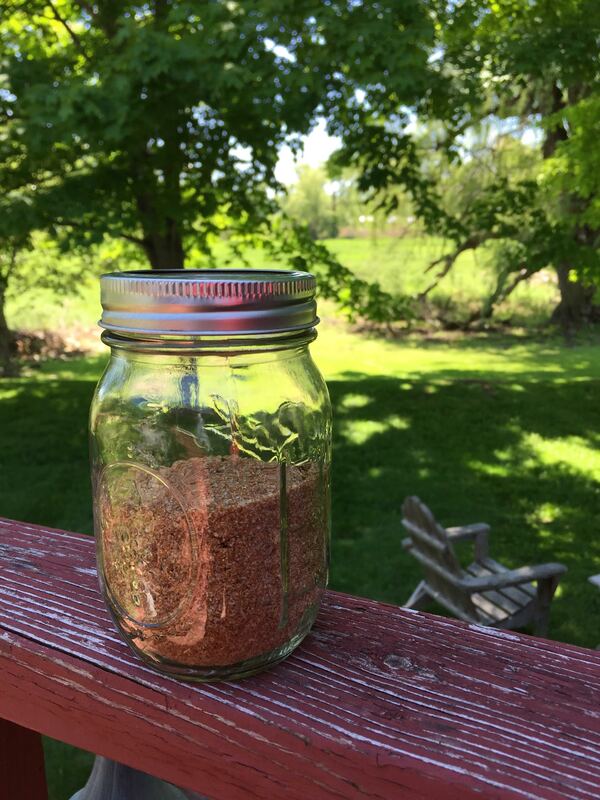 This spice rub is just terrific to have around for use on pork, duck, or chicken. Use a mini spice grinder and keep it in a tightly closed glass jar or plastic container. Combine everything in a mini spice grinder and pulse until finely ground. Wash pork chops and dry with a paper towel. Season one side of the chops with a heavy sprinkling of the spice rub. Melt the butter in the oil in a large skillet on low heat. Add sliced onions and shallots, cover for about 10 minutes. Raise heat to medium high. Add chops, seasoned side down and let cook for 4 – 5 minutes, uncovered. Salt and pepper the top side, turn the chops and add the peaches all over. Cook for another 2 minutes, then add the wine and cook for another 2 -4 minutes, uncovered, until just done, 140 degrees. Remove the chops to a platter and let rest for 5 minutes. 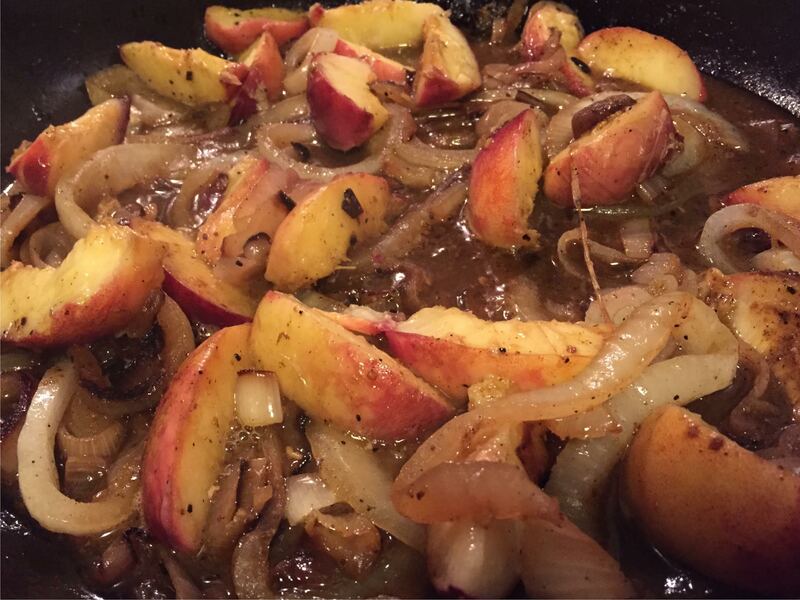 Keep the sauce and peaches warm on low heat and slightly covered. After meat has finished resting, pour peaches, onions and juices overall, garnish with chopped parsley and serve with LOVE. 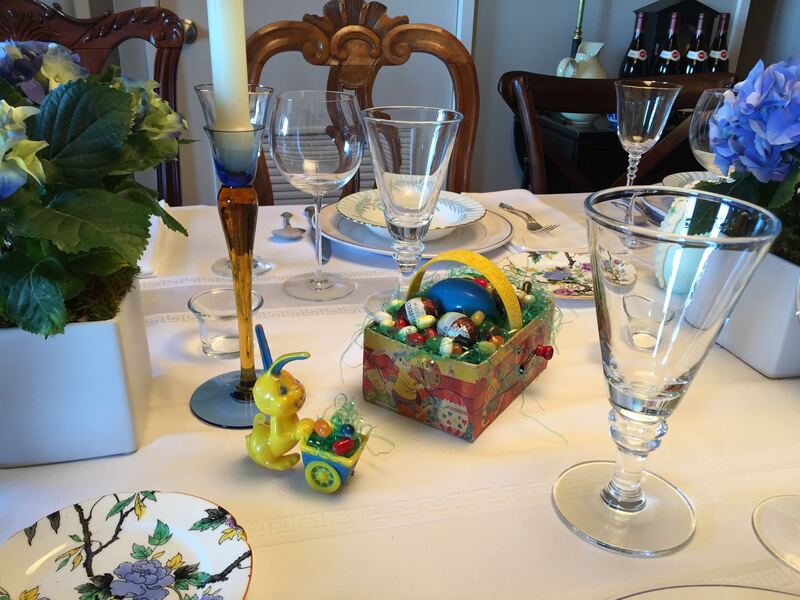 Isn’t this what Easter is all about – new beginnings? So I‘ve been slightly slammed lately, trying to get MSI off the ground, keeping PM+CO going, (cause that’s where we make money to pay the mortgage, rent and salaries) and just trying to balance it all to be able to sleep at night – which hasn’t been easy. So this past weekend, we got to go up to the country for the first time in four weeks! I cannot tell you how blessed we are to have this very simple place that is so very different from the city. I have my little painting studio there and I was working on a very abstracted landscape and got to go back to its simplicity and wow – that felt SO good! Even when we could drive up there, I had been away from the studio for so long because the snow was so deep, I wouldn’t have been able to open the doors. So I walked in last Saturday and really had to take a step back to try to remember what it was I was trying to achieve in my work. I put it together and happily continued on for hours – and it felt SO good!! New beginnings – springtime – eh?! Here is a snippet of our Peaster celebration! 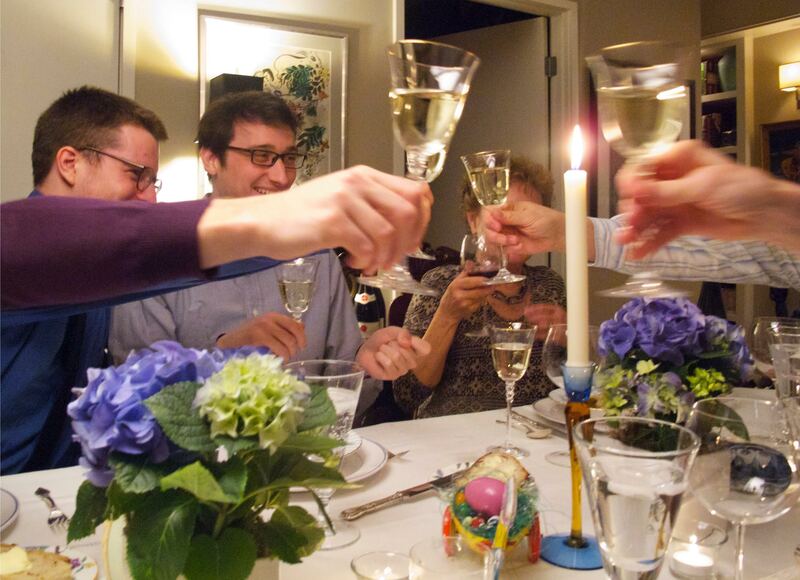 (Passover and Easter). We started with my husband’s delicious matzo bowl soup with one son’s homemade sourdough bread, followed by Barbecued Fresh Ham with an Ancho Fig Compote – both recipes from an April, 2001 issue of Food and Wine magazine – served with Parsley Buttered Egg Noodles, and Sesame Soy Sauteed Asparagus. Dessert was two gorgeous pies with whipped cream and of course, some chocolate eggs and jelly beans too! We were privileged to have one girlfriend with her Mom and stepdad, one nephew, and one close friend of one son with his mom visiting from Turkey and the four of us. We made ten in total. It was wonderful and really, my boys take over. One makes drinks and one dotes on me to not get too stressed. They both help serve (because they just think I’m not capable?) One made the fantastic loaf of sourdough bread that we served with the matzo ball soup and the other acted as my sous chef earlier in the day. Honestly, I AM amazed. They know so much. I only wish my own mother was still alive to see this. My mother loved to bake breads. She unfortunately rarely had enough time when we were all home (6 kids) and then when she did have time, no one was home to eat it all! 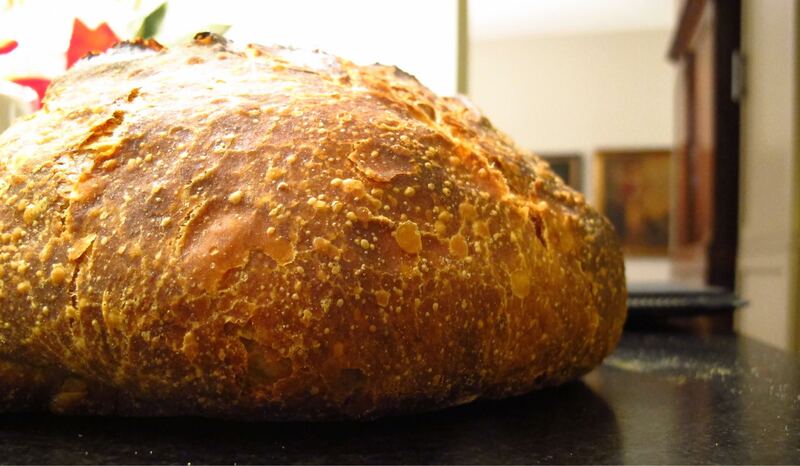 And here I have a son who has a sourdough starter (my Mom’s dream) and makes bread all the time!! He was making another loaf just yesterday morning. And this is a time consuming thing, particularly if you don’t have a big six hour dedicated time block. But he makes it work with his schedule. He’s figured out how to do it in stages, interrupted by all of his activities and it works! Here is the sourdough with an amazing crust!! And I’m sitting there thinking, I don’t make broth with every chicken…. I hope you all had a great holiday celebration – whatever you celebrate – it’s just important you get together and CELEBRATE!! EVERYTHING!! My big beautiful barbecued fresh ham! 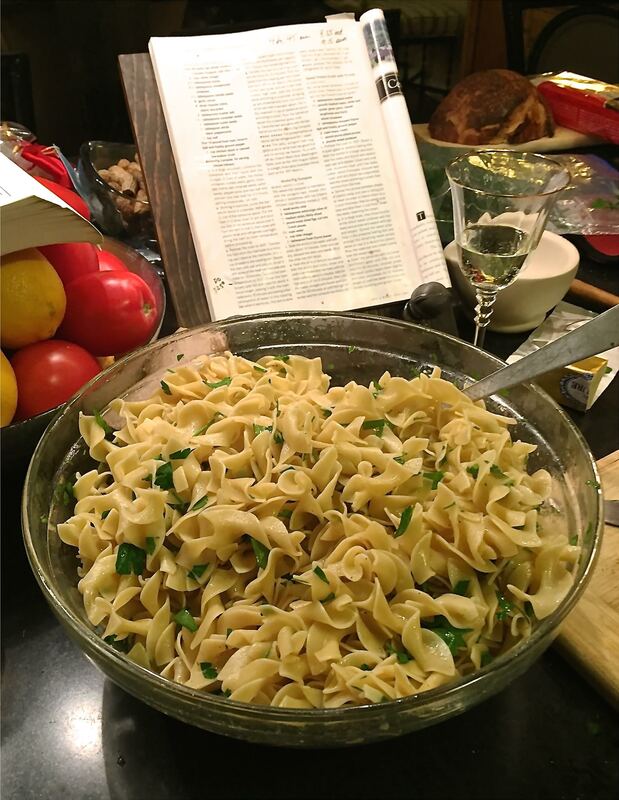 A big bowl of comforting, parsley buttered egg noodles. Who doesn’t love that? 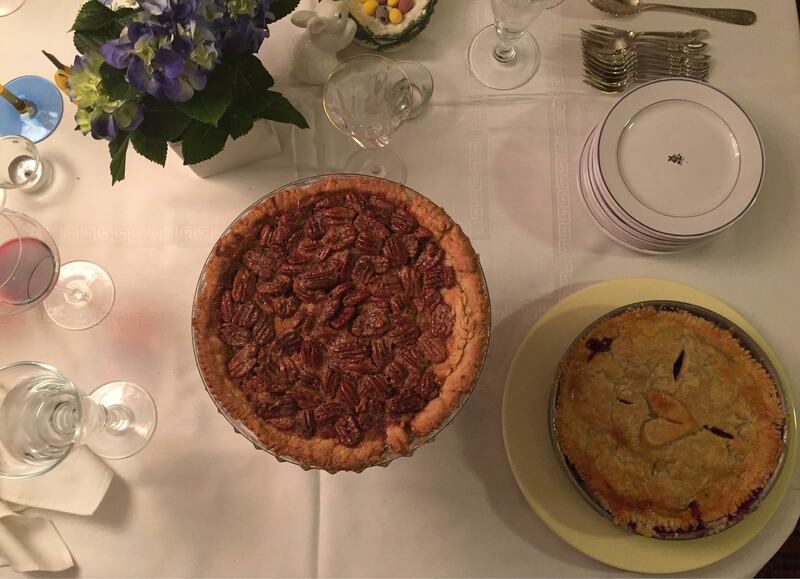 Kate’s beautiful pecan and blueberry pies. These are amazing – make them and you’ll see! Stuff a walnut in the middle of each date, close and wrap with 1/2 of a slice of bacon, having the ends meet underneath the date. Arrange on a small broiler pan with a rack so grease can drip down. Roast for 12 – 17 minutes, until the bacon is done. Let cool 5 – 10 minutes as they are much too hot straight out of the oven. Serve with LOVE and a toothpick inserted in each one, plus plenty of napkins. Delish! !